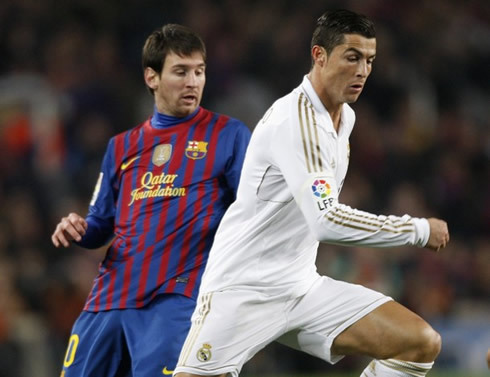 Real Madrid showed their heart and resilience, but ended drawing 2-2 in the Camp Nou and lost in aggreggate by 4-3. Cristiano Ronaldo and Karim Benzema still allowed the Madridismo to dream with an epic remontada, but their goals ended up not being enough to get past Barcelona last night. Moral victories never lead a team to titles, but Real Madrid said goodbye to the Copa del Rey with their heads up high, in a truly intense game after another 90 minutes of an exciting "Clasico", was played at full throttle. Madrid may have lost their chance to get through, but the team surely left all the Madridismo proud of the way their players battled against the odds and all the adversity in front of their biggest rivals home crowd. Despite having drawn 2-2 (4-3 in aggreggate favorable to Barça), the Merengues recovered their dignity but most importantly, they left everyone with the feeling that afterall, there's still a group of players capable of putting this Barcelona team against the ropes and that they are not the "boogeyman" many fear. In a game undeniably stained by several poor decisions that ended by annihilating Real Madrid chances of coming on top at the end, José Mourinho got very close to the shocking result his team needed to get through, and he counted with the valuable contribution of Cristiano Ronaldo and Karim Benzema, who inscribed their names on the score sheet during the 2nd half. It has certainly been one of the most convincing performances Real Madrid put against Barcelona over the last couple of years. As expected, the Merengues felt short in what ball posession stats concern, after having had the ball for 40% of the time, against 60% from Barça. However, this time José Mourinho men obtained more and better goalscoring chances throughout the entire game and there have been several factors that led to the final outcome not being a happy ending last night. Starting with the most obvious at all, Real Madrid cannot afford to waste so many good opportunities to score in a game as disputed as this. It all started with only 10 seconds of the game played, with Gonzalo Higuaín earning a 1-on-1 situation with Pinto, but failing to hit the target. Besides that, the Merengues can also complain about some bad luck in a few decisive moments of the game, such as the tremendous Ozil shot that smashed into the crossbar during the 1st half. Lastly but not less important, this was a "Clasico" with plenty of controversial plays as it is usual in these kind of games, but Real Madrid can also point a few decisive mistakes made by the referee, that allowed Barça to held to this 2-2 draw. There were two handballs claims at the Barcelona penalty-area, a disallowed goal to Sergio Ramos after an almost inexisting pull on Daniel Alves and the lack of criteria showed by the referee when showing yellow cards to Real Madrid and Barcelona players. In a 1st half where it has to be said that Real Madrid managed to surprise Barça and made enough to deserve the lead at half-time, Guardiola men would end by reaching a 2 goal lead just near the break. The Merengues created many problems to Barcelona, but were forced to pay the price of not scoring their opportunities as the Blaugrana showed their cynical side when beating Casillas twice, in the 43th and 47th minute of the 1st half. However, the match started with what could have been a turning point in this round/stage. With only 10 seconds played, Higuaín seized an opportunity coming from a bad pass made by Daniel Alves, which Piqué hesitated in receiving and allowed Pipita to put himself in front of Barcelona's goalkeeper Pinto. The Argentinian didn't show his usual killer instinct and that would be only the first of many good chances Real Madrid was about to waste on the 1st half. The game kept on and the Merengues were always showing to be more close to the goal than Barcelona. In the 25th minute, Mesut Ozil cutted inside and found enough room to blast a powerful strike that smashed into the crossbar. What a screamer it would have been! Despite being the better side during the entire 1st-half, Real Madrid failed to take the lead and Barcelona showed the Merengues how high the price can be when your side doesn't take its goalscoring opportunities. Close to the 43th minute, Lionel Messi finally managed to escape from Real Madrid markings and cutted inside in a sprint that drove many of the defenders attentions. With a sublime touch, the Argentinian would then assist his teammate on the left, Pedrito, who easily beat Casillas with a right-foot strike. 1-0 for Barcelona and it was notorious in several Real Madrid players faces, including Cristiano Ronaldo, how frustrating that goal has been. As if it wasn't enough, Barça would still score their second of the night before half-time and many people thought to have been the final blow in Real Madrid hopes to still get a positive result from the Camp Nou. In one of many strange decisions of the referee, he allowed the game to be played until near the 48th minute, after having added only 1 minute of extra-time. It was precisely in that period that Messi got tackled by Lass Diarra close to the corner of the penalty-area, in a play where many Blaugrana players claimed for a 2nd yellow card to the French player. In one of the few incidents where the referee actually helped Real Madrid with his decision by not showing the 2nd yellow card to Diarra, he would then order the free-kick to be taken, which allowed Daniel Alves to seize a rebound opportunity and score from a powerful strike, leaving no chances to Casillas. Half-time arrived and the sense of a total unfair result was easily reflected in all Real Madrid players faces. The 2nd half showed a Barcelona side more confident on their own game, mostly due to the 2 goals lead they obtained just before the break. Real Madrid didn't manage anymore to put the intensity levels they showed during the 1st half, which forced José Mourinho to quickly react and make three replacements during the first 15 minutes. In the 52th minute, Diarra got replaced by Granero, while in the 60th minute, Benzema came in for Higuaín and Callejón for Kaká. 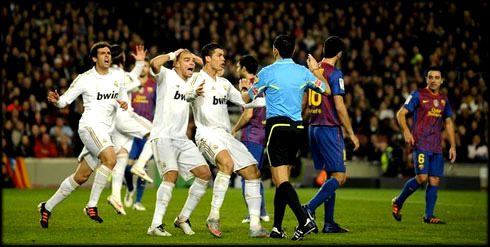 The Merengues showed a new vitality and the reaction would arrive just a few minutes later, from Cristiano Ronaldo feet. One of the most controversial plays of this game took place in the 54th minute, after Sergio Ramos scoring from an header, but the referee decided to rule it out, due to a pretense foul on Daniel Alves. There was indeed a slight pull, which made Daniel Alves immediatly fall down as he sensed danger coming and the referee just played along with the acting. A few minutes later, when the clock was marking the 68th minute, Mesut Ozil assisted Cristiano Ronaldo with a through pass and the Portuguese made use of his speed and striker instinct, to easily leave Pinto on the ground and shoot to the back of the net. Ronaldo scored his 5th career goal against Barcelona, helping the demystification regarding him not delivering in big games against major teams. Real Madrid now needed 2 more goals to turn around things into their favor, but this goal somehow allowed the team to once again believe it was possible to beat Barcelona. Just 4 minutes later, near the 72th minute, Callejón intercepted a pass with his head, from which he immediatly assisted Karim Benzema. The Frenchman found himself with some unusual space and after getting rid of Puyol brilliantly by making a small lob, he would then finish with class, beating Pinto and spreading the panic in the Camp Nou. Real Madrid was now only 1 goal away from completing the remontada. However, and despite still having 20 minutes ahead of them, the Merengues only created another good goalscoring chance in the 78th minute, when Benzema got denied the opportunity to strike the ball, after colliding with Puyol already inside Barcelona's penalty-area. From that point on, Barça ended up having several good chances to regain the lead through counter-attacks, but Real Madrid showed their brave and resilient side, by fighting until the last moment of the game. A truly great game that will surely make all the Madridismo proud of their team and allow the fans to believe it is still possible to beat Barça in the UEFA Champions League if the two teams are forced to clash again, as well as keeping the lead in La Liga until the end of the season. 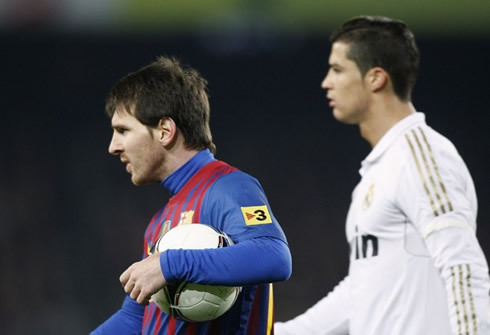 After being eliminated from the Copa del Rey against Barcelona, Real Madrid will now return to La Liga fixtures and host Zaragoza this Saturday (28-01-2012). You can watch Juventus live stream, Real Madrid vs Zaragoza , but also Villarreal vs Barcelona and Liverpool vs Manchester United from our soccer live streams section. Cristiano Ronaldo is expected to be on the line-up against Zaragoza, next Wednesday.